What a day of racing ! This amazing picture below is summarizing the feeling that we all got when we saw Tracey crossing the line in 1st place with more than 10 seconds of advance if front of anyone else. 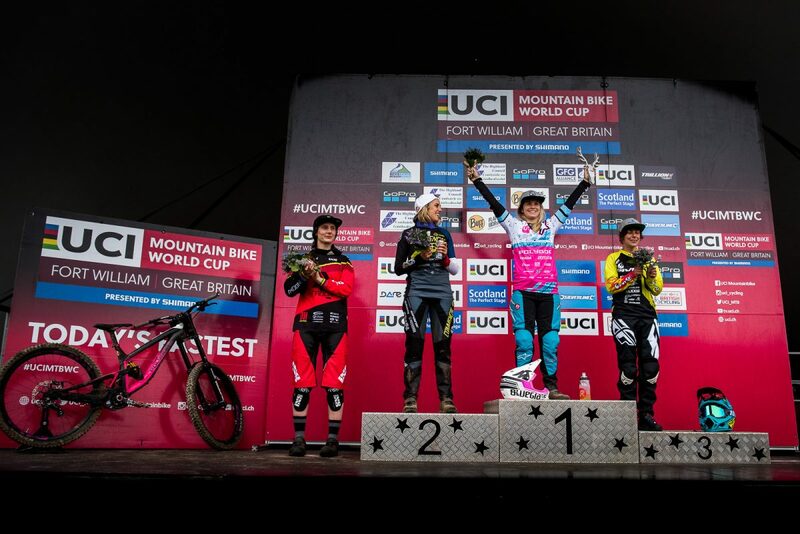 It was a big relief for so many reason ; first it was a relief because the track of Fort William has never been that hard , the woods were so slippery that during practice 50% of the riders men or women were crashing and this is what took out of the race Rachel Atherton the former winner. It was a relief too as Tracey level of dedication is just getting higher and higher every race and after so many second place she was really deserving this . 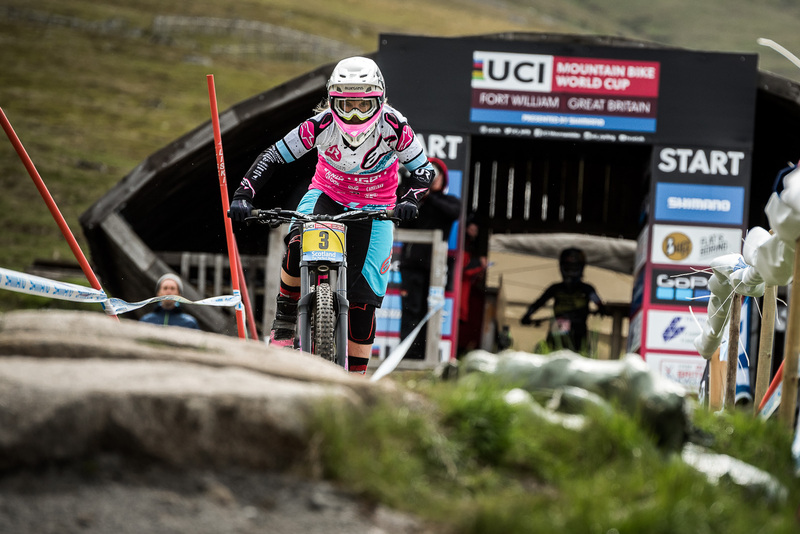 We are really proud of Tracey who is just going to keep pushing for more to keep now her new number one position at the world cup ranking. 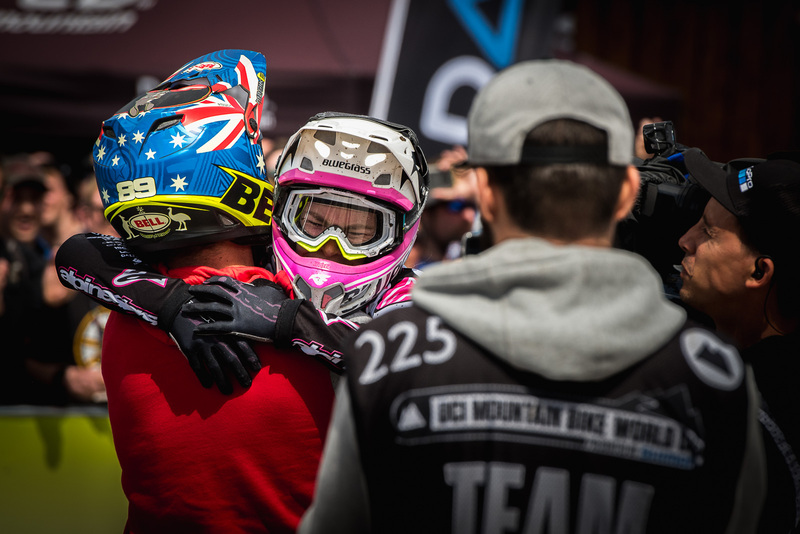 After the emotions of the women race it was time to go with the mens and we were all really happy to see Kenta Gallagher back on the bike after his broken collarbone. Kenta qualified safe in 55th position but for the race he tried a bit too much and had a big crash and didn’t finish the race. Kenta has still the smile and we are all patient as we know he will need time to get back to 100% but once he will have recover his full strength and confidence we know he is going to be turning heads. 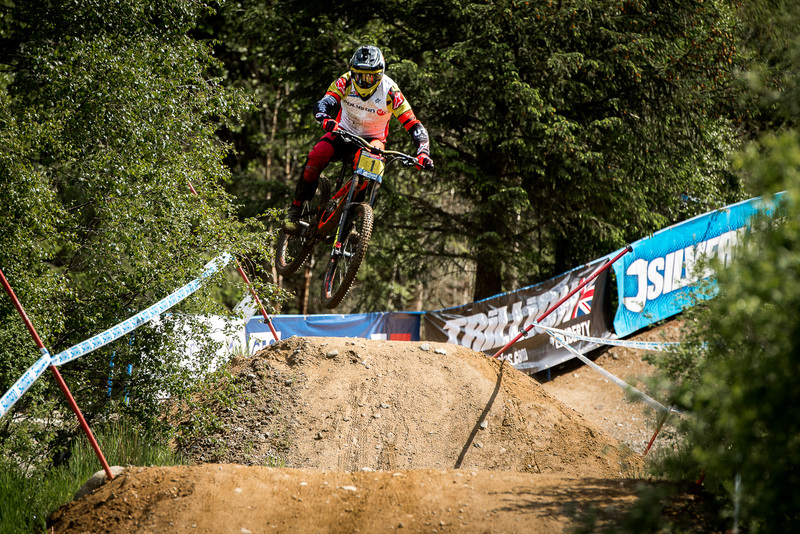 For our young rider Alexandre Fayolle it was a really high pressure weekend racing with the number 1 plate of the leader. Alex finishes 36th with a big crash in the woods sections which is a very good position considering the violence of the impact but why we are really happy with him is because Alex was able to overcome his doubts to ride 100% on his race run and as a proof of that his first split time was placing him 12th fastest on a flat section that is not the strong point of Alex . So this mean Alex was on a very good run and we know he is going to be able to come back on the podium soon if he stay on his bike. On a good note at the overall ranking Alex manage to stay in the top 5. 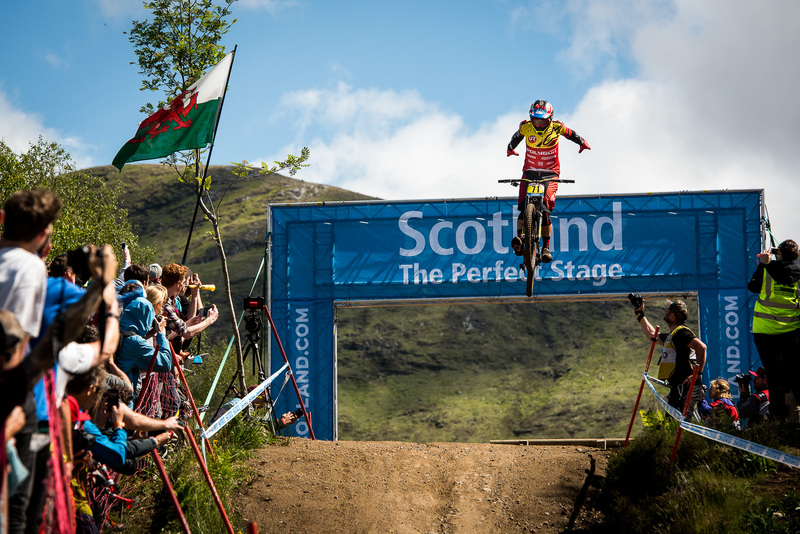 For our Sik Mik Hannah it was his 14th time racing Fort William so none of the rocks , roots , midges or the massive crowd were really scaring him and again Mick remind us that we can still count on him as he grabs an amazing top 10 ( 10th ) while doing the show for the crowd with his now classic no hander. On top of the solid result and great show that show us too that Mick is getting back some confidence and strength for the rest of the season. Mick is proving once again that he is part of the few legends still racing. 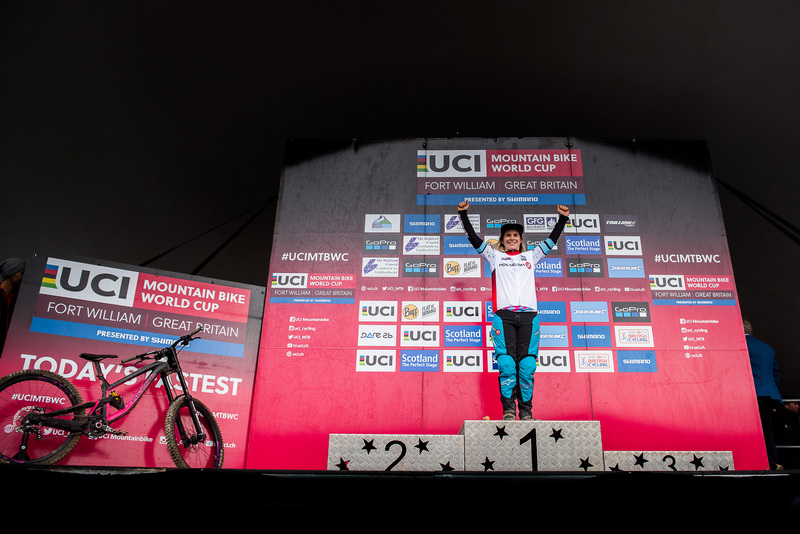 We are definitely not getting tired of those results as staffs , sponsors and athletes we all had our share of really hard work throughout the past years . So thanks again for the amazing support.